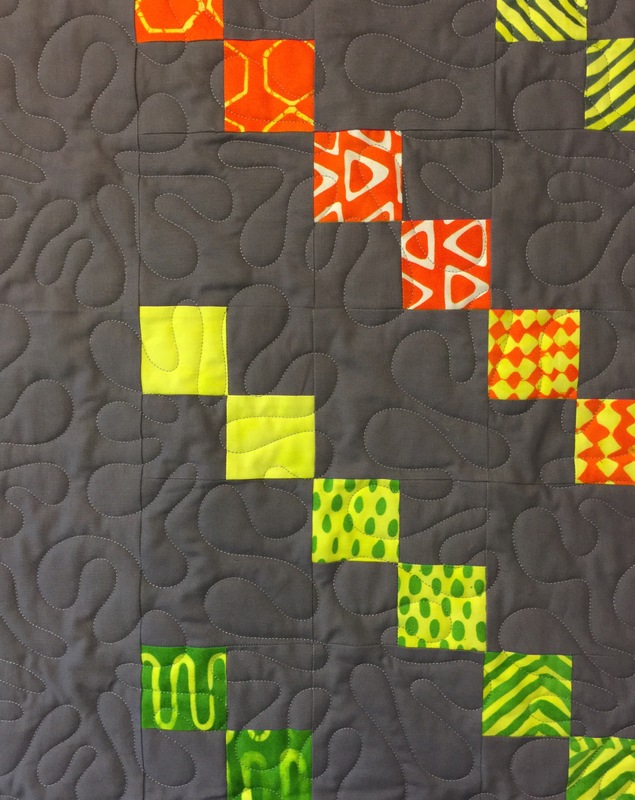 I finished this quilt and wrote this post a few weeks ago and then forgot to publish it! So here it is! The weather has not cooperated for photos lately, but here is the finished Wild Child quilt. I really love this panto called Splat and will be using it again soon! I’m still practicing my machine binding. I loved doing it by hand, but it really aggravates the carpal tunnel. I never thought I would say it, but I think the green on the back actually calms this down! 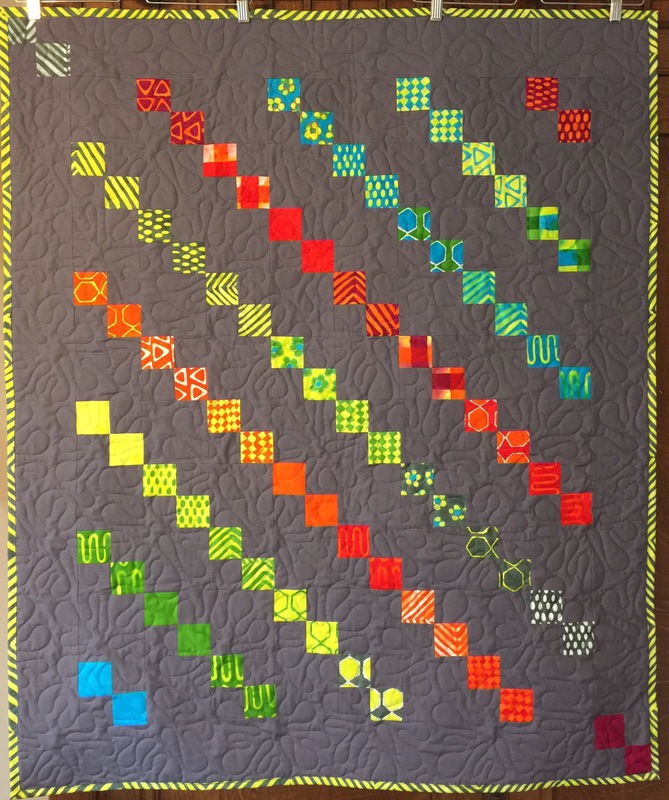 This entry was posted in Baby Quilts, Finishes, Pantographs, Uncategorized. Bookmark the permalink. 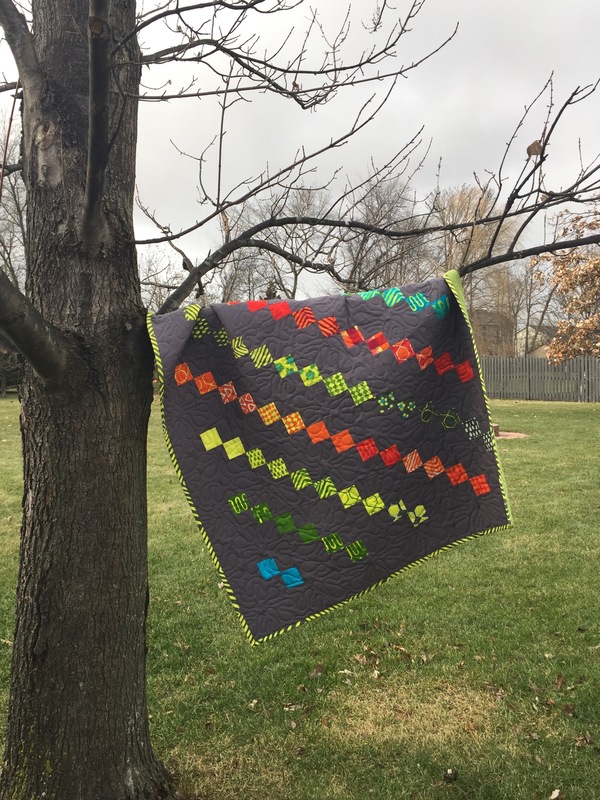 I really love that quilt! The binding is so fun, and I agree that the backing calms it down. It’s just perfect! That’s an amazing binding. I hope you get more comfortable doing machine binding. This quilt is really great. I love that you used a grey for the background. The binding is lovely, both the color and the stitching. I’ve been doing machine binding on many of my donation quilts this year. My wrists (not carpal tunnel) bother me and my goal is to keep sewing. Besides, I think machine binding is good for quilts that may be laundered frequently…baby quilts especially. Thank you for the sharing you do….every day!! Love it! I’ve always like bright wild colors. The gray is fabulous with the prints. Great job! 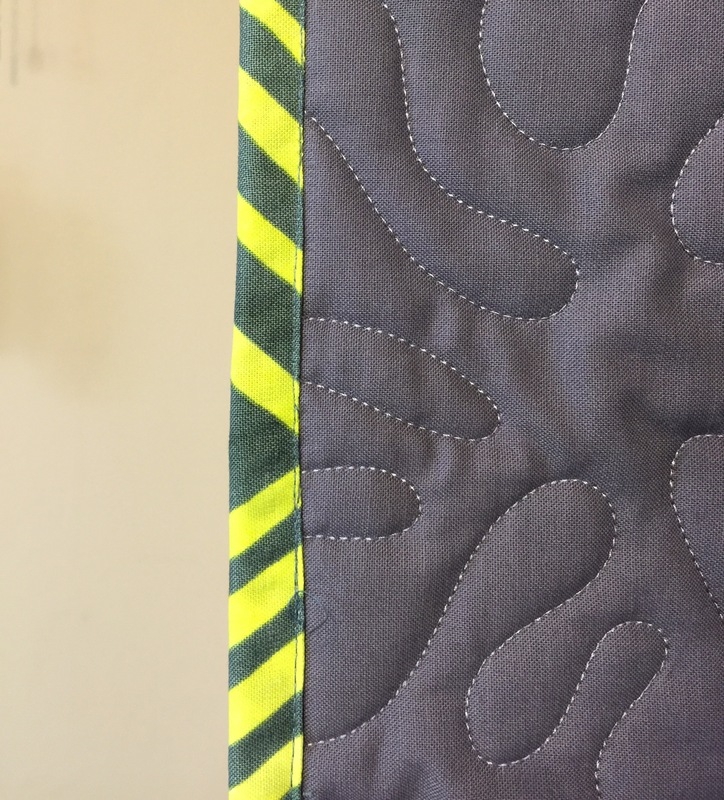 I did a machine stitched binding on my most recent quilt; went quickly and I only had to rip and restitch a couple spots where things weren’t quite right. That is a great quilt! So interesting and exciting. I like it all — the green backing and the fun binding. I haven’t quite come around to machine binding yet, but my hands do get sore when I hand stitch now. I may have to try machine binding more often. Really nice finish on this one. Was it made from a couple of charm packs? Love the background and backing you paired! Perfect name for this quilt. That dark background makes those bright colors sing. This makes me want to go out and buy some wild fabric!! I love it! Thanks for the inspiration. I didn’t think it needed to be calmed but I do think you’re right. 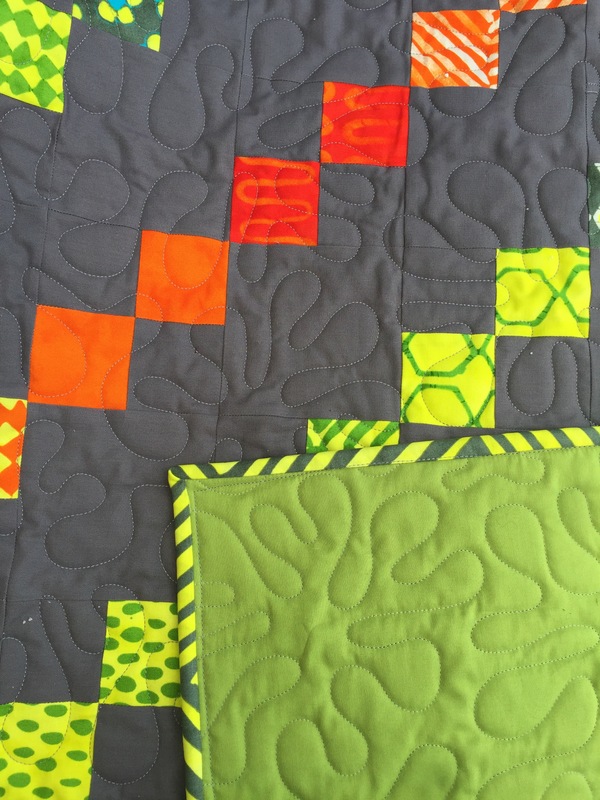 The green backing is perfect for this quilt. I love the backing and gray background is the exact setting for the splash of color of the squares.